The Canadian Chamber of Commerce has launched a campaign to improve Canada’s regulatory environment, including emphasizing international cooperation. Canada’s regulatory system is smothering business in Canada, thanks to a growing mix of complex, costly and overlapping rules from all levels of government. 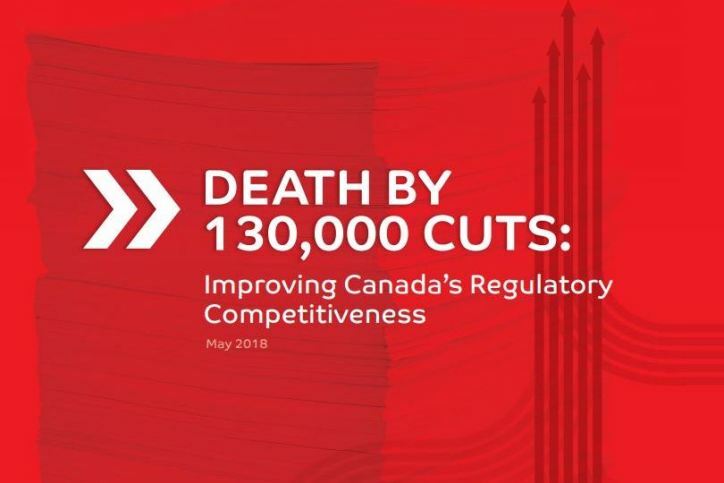 Our new report, Death by 130,000 Cuts: Improving Canada’s Regulatory Competitiveness, calls on governments to modernize their regulatory frameworks and give businesses in Canada room to thrive. 130,000 cuts, or 134,754 to be exact, is the total number of federal requirements that impose administrative burden on businesses, as reported by the Treasury Board. These requirements have created a costly and uncertain environment in which to invest and operate a business. Increasing compliance costs and inefficient and unpredictable regulatory processes negatively affect business productivity, innovation and, ultimately, Canada’s fiscal stability. This creates significant competitive risks for Canada, especially with the U.S., our largest competitor and trading partner, having recently enacted significant corporate tax and regulatory reforms. Our report assesses these regulatory shortcomings and recommends how the government and businesses can work together to create a system that is more transparent, predictable and efficient. • Forming a government-business regulatory competitiveness working group. • Providing regulators economic growth and competitiveness mandates. • Fixing regulatory consultations through earlier engagement with stakeholders while ensuring processes are transparent and evidence-based. • Increasing federal leadership in eliminating interprovincial regulatory barriers. This report marks the beginning of our campaign to collaborate with elected officials to reverse the continuing deterioration of Canada’s regulatory environment in order to maximize economic growth. It is time for federal and provincial governments to #RegulateSmarter. To view our report and its full set of recommendations, visit RegulateSmarter.ca.